You will most definitely throw a Hissy Fit if you miss out on this dip. It is SOOOO good! How could it not be when it has sausage and Velveeta in it? YUM! I could make a meal out of this dip. I actually might have eaten this for lunch the day I tested it out. No shame! It is that good! I used Velveeta shreds in this recipe. I found them at Walmart in the refrigerated cheese section. It is shredded Velveeta cheese. 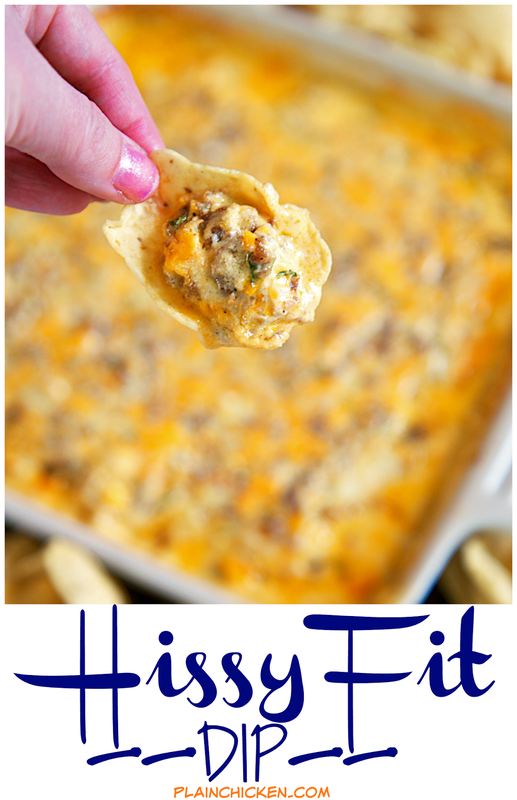 It is great for dip recipes like this. If you can't find the Velveeta shreds, just make sure to chop up your Velveeta really good. 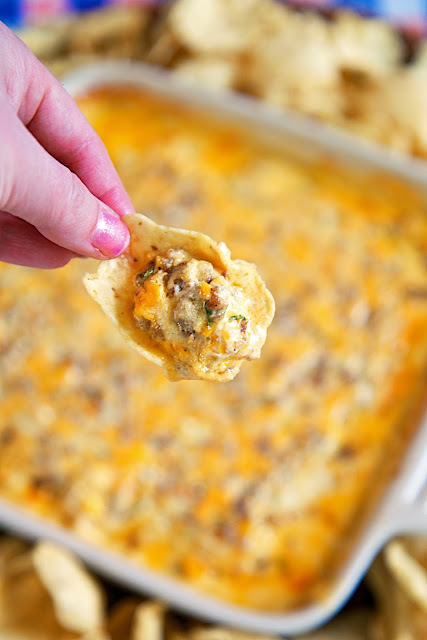 You don't want big clumps of Velveeta in the dip. 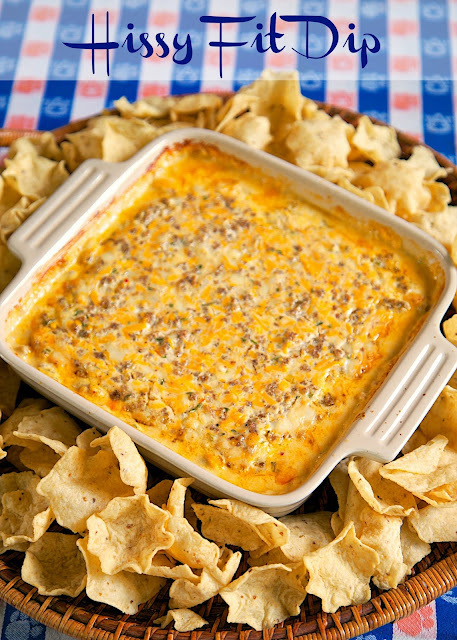 This dip can be mixed-up ahead of time and refrigerated overnight before baking. I don't think it would freeze well because it is sour cream based. Serve this with tortilla chips, Fritos and/or veggies. Preheat oven to 350 degrees. Lightly spray a 9x9-inch pan with cooking spray and set aside. In a large skillet, cook sausage until no longer pink. Drain fat. In a large bowl, mix together sausage and remaining ingredients. Pour into prepared pan. Do you have a favorite sausage? Country, Sage, Hot, Italian? Any type will work just fine. Just pick your favorite. Do you have a favorite sausage variety? Regular, Sage, Hot, Italian? Can you use regular shredded cheese? I'm not a fan of Velveeta. Thanks. Has anybody tried replacing the sour cream with plain Greek yogurt? I always do so for sour cream (in any recipe) and wondered if this recipe would still be great that way. I haven't tried it, but I think it would be fine. What about making this with ground chicken?? What about doing this in a crockpot? What if you can't find Muenster cheese? Anyone have any other alternatives? Would this work with ground beef instead of sausage? I made this for a Black Friday jam party and it was delicious! - no changes to recipe. It doesn't make a huge amount, so if you're making it for 12+ people, I would suggest doubling the recipe. Thanks for sharing this great appetizer. Add a couple of sliced jalapenos and it's even better. Oh yes!!! I’ll do that next time. Looks delicious! Definitely going to try this recipe! !